Bull fighting was usually performed in campo San Polo, in a way similar to the show in Pamplona, Spain. As a matter of fact, the bulls that were left to run free in Venice were not young, strong and in hanger like the Spanish ones: they were on the contrary old and wind-broken animals, when not oxes tout-court. Left free or tied with ropes on the horns, the poor animals, after they had to suffer maltreatments and jests by the umans (which were much more beasts than the bulls, indeed), were finally tored by dogs and butchered. 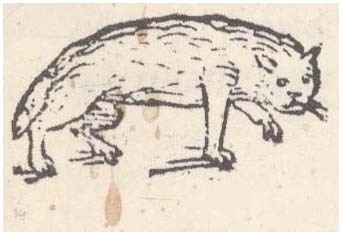 A less jocular form of tauromachy was that one concerning a bull and twelve pigs dued to the Doge by the Patriarch of Aquileia after a revolt against the Serenissima that the Patriarch did together with twelve feudal vassals, for the control of Grado's saltpans. 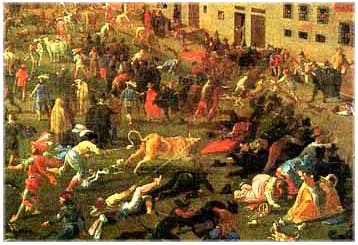 The bull and the twelve hogs, allegorically representing the Patriarch and the rebels, were every year formerly damned to death by the court, and the execution was performed in St. Mark's square via dogs toring. Once the animals were exhausted by the dogs, they were butchered and their meats distributed to the nobles in poornes of the Republic. The Civil evolution of the Venetian Government banned this cruel use in 1245. As long as the butchers survived in Venice as a Craft, indeed, survived the use of cutting a oxe's head in one shot as a mastery proof in that craft, performed once a year in the last Thursday of the Carnival. A very cruel play, used until late 18th century in popular festivals, mainly in Santa Maria Formosa Square. It was done tieing a pussycat over a vertical table by mean of leather belts on the body, leaving legs and nails free. The player, with his head shaved and protecting his face with both the hands, had to be able to kill the cat head-butting her. This game was popular until few years ago, and sometimes it is still proposed during rional fests; it consists in being able to catch with one´s teeth an eel which swims in a tub full of water blackened with cuttlefish ink. Boxing (and full-contact :-) ) match between two couples of champions belonging to the two companies in which the town was dividing for the occasion; the Nicolotti (inhabitants of the area of San Nicolò dei Mendicoli, including Santa Croce, San Polo, part of Dorsoduro and part of Cannaregio) v/s the Castellani (area of San Marco, Lido, the rest of Dorsoduro and Cannaregio and, of course, Castello). 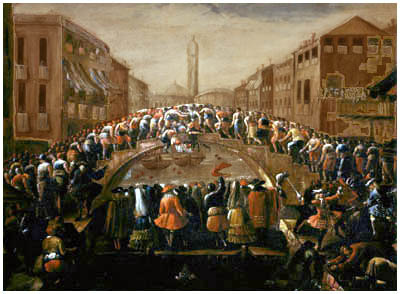 The match was taking place mainly on some bridges without rails: the champions located themselves on the four corners, on places marked on the floor with a marble footstep each, while on both sides of the bridges were massing the opposite crowds of partecipants, some armed with long poles to sustain their champions and to push down in the water the adversaries. The marble footsteps (sampe) can still be seen on Diedo bridge in San Marziale and on the bridge dei Pugni (of the Punches) in San Barnaba; to tell the truth, these last ones were removed and substituted with roughly shaped ones during the so called "restaurations" in 2005. During the late centuries of the Republic, the boxing duel between Castellani and Nicolotti was substituted by a more civil atletic competition: The Strenghts of Hercules. Lightweight boats with brave crews armed with top-padded poles trying to unsaddle each other. This game is still played sometimes during the Carnival. They were exercises of adroitness, agility and balance. 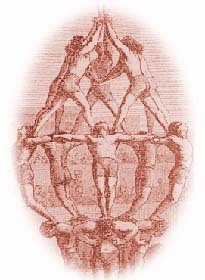 A planking was set on some barrels (if the game was played on land) or on two flatboats (whether on the water); on such an unstable socket, the athletes had to form human pyramids, reaching sometimes the height of 8 men. At the base stood 10 / 12 men, called saorna, that is ballast (the "porteurs" of modern circuses), which joined each other carrying wooden poles on their shoulders. A child, called cimiereto was then climbing on top to cut a caper or to perform handsprings (tombolo or impalo). The pyramids were figuratives or allegorical, between the most famous the following are remembered: "Il Colosso di Rodi" (The Colossus of Rhodes), "La Cassa di Maometto" (Mohammed´s Case), "La Bella Venezia" (Beautiful Venice), "L´Unione" (The Union), "La Verginella" (The Little Virgin) "La Gloria" (The Glory) and "La Fama" (The Fame).